Bad Blood high VG shortfill e-liquid produces a cartoon caper, super cool flavoured vape. Enjoy one of our Thumbs Up range with this mix of blackcurrant and a hint of mint. 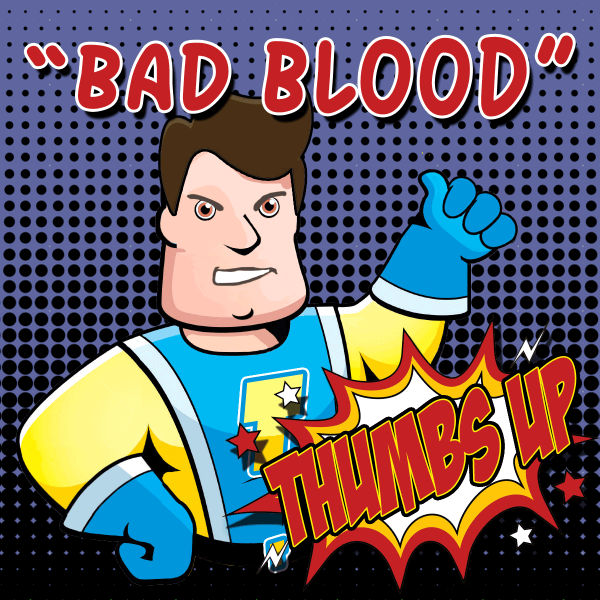 The Thumbs Up range brings out the inner superhero in you via tasty e-liquid. The great tastes help you find an all day vape without the cape and tights . Save the earth with Bad Blood e-juice now. Our 80VG-20PG (when mixed with 10ml nicotine shots, not supplied) short fill range of high VG juices are TPD compliant and are guaranteed to give you a full flavour every time. Each bottle of Bad Blood e-liquid is available in either a 50ml or 100ml measure inside a Gorilla bottle. Consequently, this makes it possible to add a single 10ml nicotine shot (purchased separately) to create a 3mg strength e-liquid with a 50ml bottle. For the 100ml bottle, you can add 2x10ml nicotine shorts to make a 3mg strength e-liquid. Therefore, if you choose to vape with or without nicotine, you can enjoy the great Thumbs Up taste of Bad Blood. You can use Bad Blood high VG shortfill e-liquid with or without a nicotine shot (purchased separately) because we provide each 50ml/100ml bottle with an easy to use screw out nib. To create a 3mg e-liquid simply follow these simple instructions. First of all, unscrew the top of your Bad Blood e-liquid to reveal the nib and furthermore unscrew the nib and remove. Open your 10ml nicotine shots (for 50ml bottle, use a single shot and for 100ml use 2x10ml shots) and carefully pour the nicotine contents into your Bad Blood e-liquid. Replace nib, screw to tighten and in addition replace the bottle cap. Finally, shake the bottle vigorously until the contents mix. Finally, all that’s left to do is fill your e-cig tank and vape as normal to enjoy a 3mg Bad Blood high VG e-liquid.